In the everlasting search for the perfect egg fly to drift this upcoming spring; one fly has set itself apart from all the rest. The soft touch spawn pattern incorporates all the great characteristics of the traditional egg flies with a few new secrets of its own. 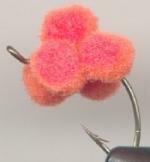 Like most of the other egg flies on the market today the soft touch spawn has a superb bright orange color that will outlast even the stubbornest of fisherman. One of the major disadvantages of egg patterns being used by fisherman today is that many do not incorporate a weight into their construction. Most people simply add series of small split shots tacked onto the line to help get the fly down to the bottom, but this really hampers the ability of casting the fly's any distance at all. The softex spawn is different in this regard because of its ability to have a lead free split shot placed in its core nulifing the use of any further weighting techniques. Another quality that sets this fly apart from other egg patterns is this fly's special make up. The softex spawn uses yarn coated with a flexible adhesive to create a hardened spongy texture most closely resembling natural fish eggs. Another advantage that this fly yields over others would be that it never loses its life like shape since an adhesive covers it. More traditional yarn egg flies tend to mash down and pull free from them selves after little use. What's the importance of egg flies to a fly fisherman; well the natural eggs from that come from spawning fish make up a more than a substantial percentage of the seasonal food base in streams for foraging trout species. With the northern Wisconsin stream fish, which I am most familiar with, feeding on the roe of spawning salmon and steelhead is seasonally common. The fish are able to set themselves in a downstream position from other spawning fish and forage aggressively on eggs that happen to wash out or be knocked out of the spawning beds. All the salmonoid species, especially steelhead, browns and brookies are seasonal egg eaters. The eggs from spawning fish may come in many different sizes and colors. Eggs from spawning rainbow trout are approximately 3/16" in size and can be characterized with a translucent yellowish orange color. Spawning steelhead and coho salmon produce almost identical eggs that are about a 1/4" in size and basically have the same translucent yellowish orange color seen in rainbows. Chinook salmon eggs produce similar colored eggs to the other mentioned species but have a slightly larger size at 3/8". Brown trout have eggs that are roughly a ¼ inch in size and are bright orange like the rest. Imitating these different types of eggs can be very lucrative for fly fisherman like all other fisherman taking into account that the season and weather conditions are correct for the species you are targeting. 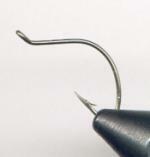 1.Start this fly by placing your hook into your vice securely and attaching your thread to the hook shank. If you want to incorporate a weight into your fly pattern clip the split shot onto the middle of the hook shank and tie it down securely with thread (in my example I am not going to be weighting the fly). After the weight is secured in place apply a liberal amount of head cement to the weight just make sure it is not going to be shaken free during casting. 2.Before you go any further you have to decide what you will be using for the egg section of the pattern. Like I mentioned above in the materials list you could use pre-made orange pom poms or simply make glo-bug yarn and form your own eggs. To do this simply rub a little dubbing wax onto your fingers and take about a one-inch section of glo-bug yarn and twist it between your fingers till you have a small ball. 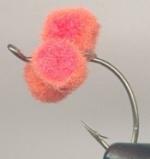 You are going to need about 5-6 separate little eggs to complete the pattern so make sure that you have them all made before you attempt to attach any to the hook shank. 3.With all the eggs ready mix up a small batch of 5-minute epoxy. Let the epoxy start to gel slightly and then proceed to apply it liberally to the hook shank and all around the lead-free split shot (if you choose to weight your fly). With the epoxy slightly set (gel form) you should not have too many problems with the epoxy running or the eggs sliding off the hook. 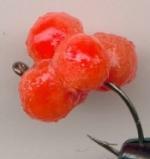 4.Carefully place the eggs onto the hook shank completely covering the lead free split shot. Make sure that each egg comes into contact with a good amount of epoxy so that it will be held securely to the hook shank. The secret is to only allow the bottom of the egg patterns to touch the epoxy so that the top portions stay soft. If you are having problems managing all the eggs on the hook shank at once simply do the epoxying steps twice. Only placing half the eggs on the hook shank each time. 5.After the epoxy has set and you are happy with the position of the eggs on the hook shank all that is left to do is coat the eggs with softex adhesive. With a hemostat take your fly and completely submerge it in the softex adhesive. As you pull the fly out of the adhesive you will have to clean it a little with your bodkin because of some large clumps of softex that will not run off the fly. You want the fly to be evenly/ thinly coated with softex so that it will dry and be pulled into the egg pattern and not create a hard outer shell. Be careful when dipping the fly so that you do not to dip the hook point in the adhesive or else you will have to clean it later. Even though the fly will feel dry after about 20minutes let it set for a few hours before use to completely dry out. Once the fly has completely dried out, take a red permanent marker and color some small red dots onto each one of the separate eggs. This will help to more closely mimic what the real fish eggs look like.